One day I’ll get a weekend post done on a Monday. I’m not sure when, but it’ll happen. It was actually a pretty chill weekend. Now that we have our two major projects (basement and nursery) checked off, we can allow ourselves to relax and hang out with each other before we become a party of three. 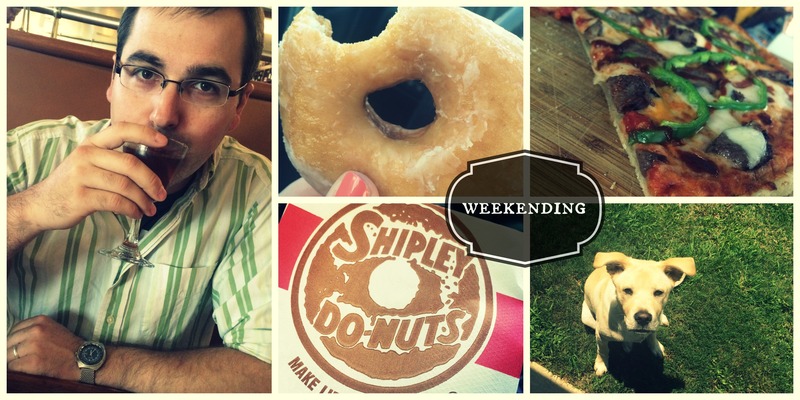 Friday started out awesome with National Doughnut Day — so I headed to Shipley’s to celebrate. I loved getting that free doughnut, and I picked up a couple dozen for the work peeps. Apparently I’m the only one that likes doughnuts though as I ate three that day. I brought back home at least a dozen. Not that I was complaining. I also got to see sweet coworkers pup (bottom right) on Friday too. He’s so mischievous… I love him. Friday night we went to Chez Fon Fon (more on that later) and then to a Barons game, where I got to cross off Friday night fireworks from my Bham Bucket list. Saturday was spent watching TV pretty much all day, and it was fantastic. And on Sunday, we blew up our pool and floated all day. It was so hot, and it was so refreshing, and I even got to finish B.J. Novak’s One More Thing; Stories and Other Stories. Which I highly recommend if you’re in the mood for sarcasm and fun. All in all, it was a great weekend — I’m hoping for a repeat next time around! Mmmmm donuts, dogs, pool time and burgers? Sounds like the perfect weekend to me!!! You better be catching up with PLL!!!! Sounds very relaxing!! Glad your fitting in Quality time before baby! Ooo I love Shipley’s! We don’t have them here but we went when we were in Texas for a friend’s wedding, so good! Yay for relaxing time before baby comes!